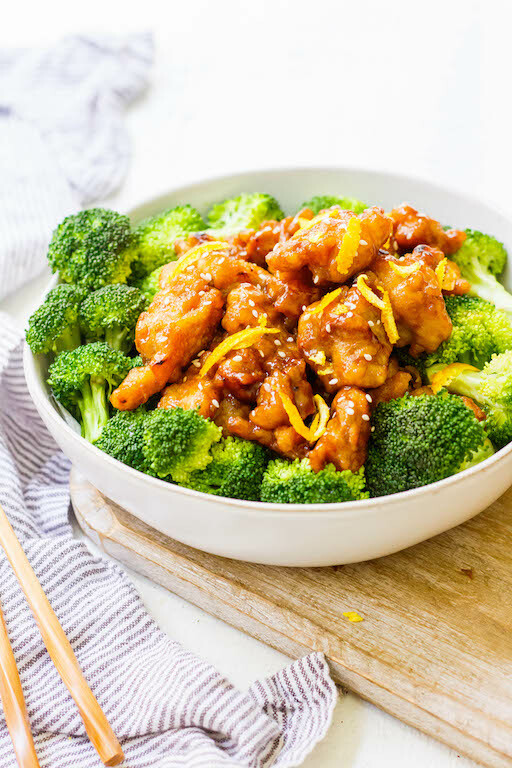 This easy Whole30 Chinese orange chicken is the best takeout fake-out ever. 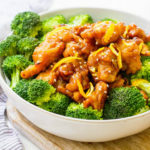 Sometimes you just need some orange chicken in your life, and this version is much healthier and there’s no delivery fee! 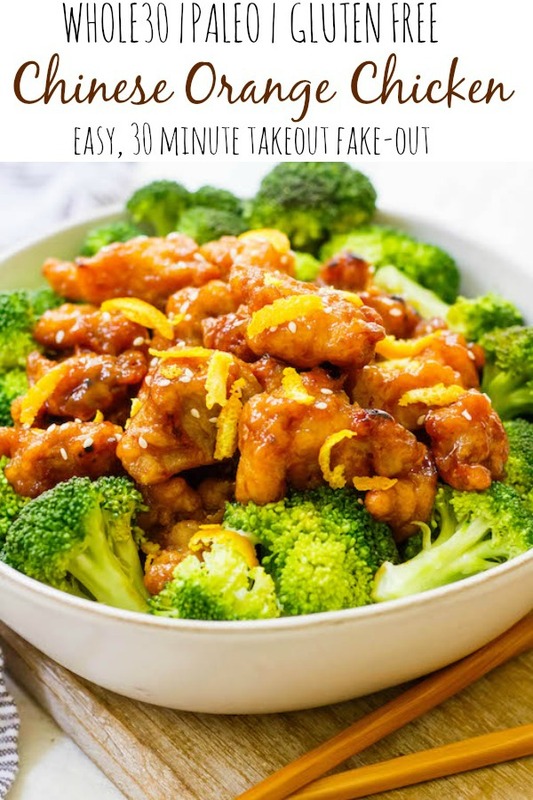 It’s also a Paleo orange chicken recipe, which makes it gluten free and made from real ingredients, so you can skip the MSG! In a past life, it was not uncommon of me to order Chinese delivery at least once a week. It was my favorite go-to. I’d almost always order the orange chicken. It still remains one of my favorite flavors. Which is why I knew I needed to figure out how to make it Paleo and Whole30. This Whole30 Chinese orange chicken obviously isn’t the real thing, but, I will say, it’s a really great takeout fake-out. When I started making this for myself and my boyfriend, he prompted me to add it to the blog to go along with the other Chinese inspired recipes I have here. It took a little refining and tweaking to get it blog ready, but hey, neither of us complained about having to eat it multiple times! In the Whole30 orange chicken recipe, I do suggest using cassava flour. However, you can make it with alternatives like coconut flour. You could use almond flour, but it won’t have exactly the same consistency once cooked and be more gritty. Cassava flour has become my favorite for breading things. In this case, it gives it a lighter more “fried” taste than coconut flour does, in my opinion. Cassava can be found at many health food stores nowadays, like Whole Foods. But it’s also available on Thrive Market and Amazon. Chinese 5 spice is another spice you’ll need for the Whole30 orange chicken. I’m not sure how common it’s included in most of our spice cabinets. If you don’t already have it, you can pick it up at Target, Whole Foods, Amazon, Hy-Vee, and a number of other grocery stores. It’s sometimes called just “5 spice” on the label, if you can’t find Chinese 5 spice. They’re the same thing though, not to worry! 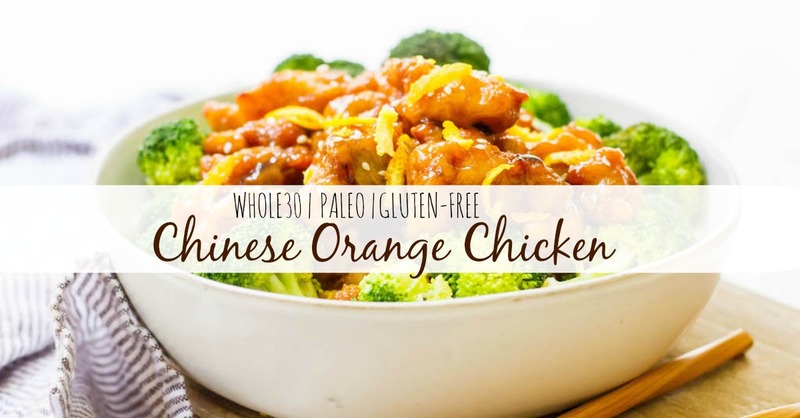 You can serve this Paleo and Whole30 Chinese orange chicken over cauliflower rice, roasted or sautéed broccoli or throw it into a stir fry! Mix flour, 1 teaspoon salt, and 1 teaspoon garlic powder together in a large bowl. Add chicken cubes. Toss with your hands until equally coated. Heat avocado oil and ghee in a large skillet until melted and hot. Add some of the chicken cubes (do not overcrowd the pan) using tongs, and cook until browned, about 2 minutes per side. Remove and set on a plate. Repeat process with remaining chicken until all are cooked. Note: you may have to add additional ghee and oil to the pan if doing more than 2 batches. 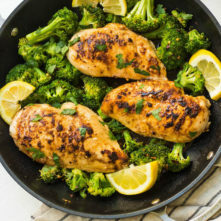 For the sauce: in the same pan, add orange juice, coconut aminos, almond butter, sesame oil, 1 teaspoon salt, 1 teaspoon garlic powder, minced ginger, vinegar, 5 spice seasoning, pepper and dates. The dates will not be covered by the sauce but that’s okay. Just ensure to flip dates over as sauce comes to a simmer. Bring to a simmer for 5-10 minutes, until all ingredients are combined and dates are soft. Remove from heat and pour into a food processor or use immersion blender to blend dates into the sauce. Transfer the sauce back into the pan and add the chicken. Bring to a simmer again and stir frequently to evenly coat chicken. If you prefer a thicker sauce, at this time mix arrowroot flour with 1 tablespoon water in a small dish until dissolved and then pour into the pan. Stir to combine and allow to simmer for another 2-3 minutes to thicken. 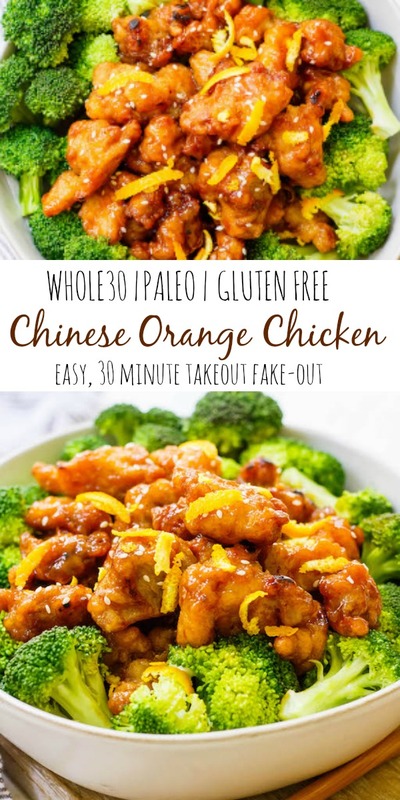 This Whole30 Chinese Orange Chicken post may contain some links that are affiliate links, though products are ones I use personally and recommend. When you purchase anything using my links, it costs you absolutely nothing extra, but it does give wholekitchensink.com a little financial support which helps to keep this blog running. Thank you for your continued support, both with your dollars and your interest. Oh my god. This is SO GOOD. I made it last night and my whole family ate every last piece. Already planning on making it next week again!! This looks amazing! 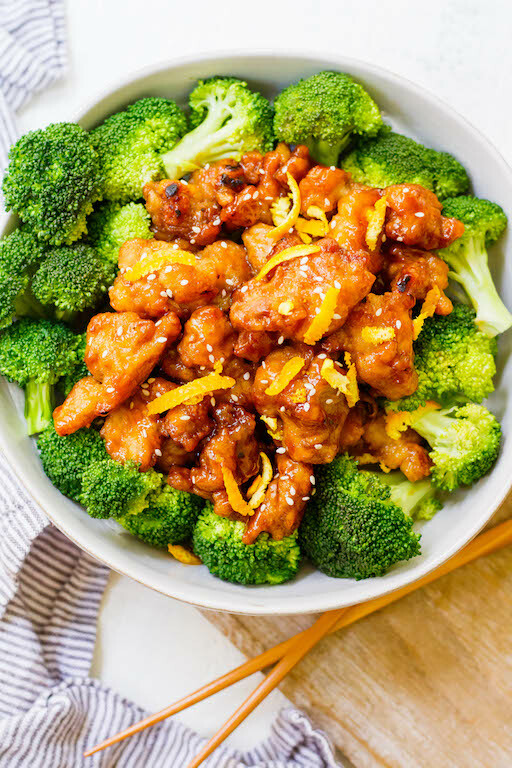 I love Orange Chicken but would love to try a healthy substitute! This is one of my favorite recipes to date. It tastes even better than takeout!!!! Wanted to love this recipe. Used almond flour and forgot ginger. I am not sure why but it had a strange flavor to it. Best whole 30 orange chicken yet! I’ve tried a few recipes but this one has made the repeat list. Chicken was crispy and the sauce turned out so flavorful. Thank you for the wonderful recipe. We served with some cauliflower fried rice and it hit the spot. Would it completely ruin this dish, to leave out the Chinese 5 Spice? The recipe did not mention when to use the kasava flour. Just made this tonight and we all loved it. My 2 year old son ate it right up! Thanks for this recipe, definitely a good change of pace with the meals. Hi Sabrina! I’m so happy to hear the family enjoyed it! Thanks so much! I cannot for the life of me figure out why this recipe has almond butter in it. It gave it a horrible taste and texture. I re-made it eliminating the almond butter and it was fantastic. I only made this bc my mom was out for the night and it looked easy but OH MY GOODNESS IT CHANGED MY LIFE. It’s THAT good! Definitely will make again!! LOVE to hear this, Maggie!! I’m so glad you loved it!! Just beginning reintroduction coming off of whole 30 & made this with some brown rice-it was a hit! My husband kept asking if I was sure this is w30 compliant! He’s taking leftovers with cauliflower rice for lunch tomorrow. This is definitely making it into our regular menu ???? I’ve made this twice and it’s so delicious! The second time around I made a couple changes: I used squeezed fresh oranges and added 1.5 tsp of orange zest, which really made the orange flavor pop. Also, after front the chicken I let the pan cool before adding ingredients for the sauce because the first time some of my ingredients burned. Awesome recipe! Awesome!! Thank you so much for letting me know! The orange zest sounds amazing! 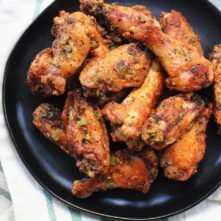 Is it possible to use and air fryer instead of the oil? I haven’t tried it, but I’m sure it would be okay! Thank you, Bailey! I made it and it was delish! I think I may try the air fryer and eliminating the almond butter (it was just a little too overpowering for me). 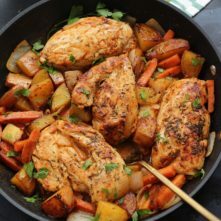 But thanks again for an amazing and easy whole30 dinner! My family (especially my husband) raved!!! Wow these were soooo good! I didn’t have cassava flour so made it without and it was still great! Tasted just like Pick Up Stix Orange Chicken! I can’t believe I made something that tasted so good!! Ohh I LOVE THIS! Thank you so much Lauren! SOooooo good, it was a little salty so I think I will omit the salt next time and just let the Amnions do their thing. But really good!